Corporations capitalize on this sentiment, featuring images of happy looking animals on an idyllic farm setting. We’ve even noticed restaurants here in Houston displaying nicely framed photographs of beautiful cows and pigs, preassembly to “show” guests where the body parts and byproducts they are eating came from. 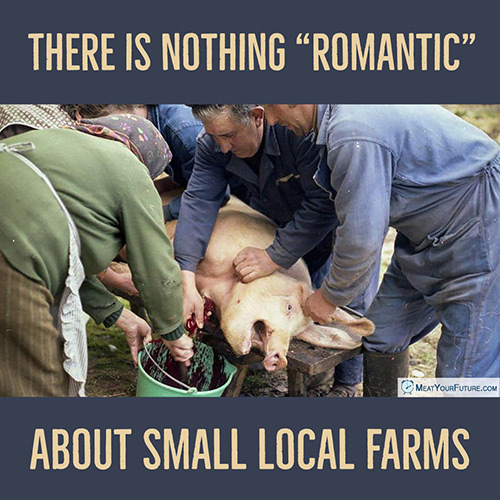 But what does “local” and “small” farming actually mean for the animals? Well, not much if anything at all. It still means terror and an early death, just like on any other farm. The animals are still forcefully killed against their will, at a fraction of their natural lifespan, for something none of us needs. We have personally been to small slaughterhouses ourselves, which “process” organic, pasture-fed, free-range animals. The animals are still frantic and terrified. They still smell the blood of those who were butchered before them. They fight desperately in vain attempts to avoid being killed. Eating animals is also a grossly inefficient use of resources and an environmental disaster. It is not a way to get us closer to nature, it’s one of primary ways we are destroying nature (among other things, it’s the number one cause of deforestation in the world due to its enormous land footprint – a footprint that would only get worse, at scale, with a shift to “smaller” (but less concentrated) animal operations). So, instead of breeding and killing terrified animals at the expense of the environment and the animals, how about planting gardens or exploring the outdoors to get in touch with nature? In the end, paying for vulnerable animals to be exploited and killed is NOT something to romanticize – at any scale or proximity. Please consider seriously these issues, and (at a minimum) please don’t harm animals when you don’t have to by going vegan. Your health and the environment will greatly benefit as well.